Imagine trying to measure a tennis ball that bounces wildly, every time to a distance a million times its own size. The bouncing obviously creates enormous "background noise" that interferes with the measurement. But if you attach the ball directly to a measuring device, so they bounce together, you can eliminate the noise problem. As reported recently in Nature, physicists at the Weizmann Institute of Science used a similar trick to measure the interaction between the smallest possible magnets -- two single electrons -- after neutralizing magnetic noise that was a million times stronger than the signal they needed to detect. Dr. Roee Ozeri of the Institute's Physics of Complex Systems Department says: "The electron has spin, a form of orientation involving two opposing magnetic poles. In fact, it's a tiny bar magnet." The question is whether pairs of electrons act like regular bar magnets in which the opposite poles attract one another. Dr. Shlomi Kotler performed the study while a graduate student under Dr. Ozeri's guidance, with Drs. Nitzan Akerman, Nir Navon and Yinnon Glickman. Detecting the magnetic interaction of two electrons poses an enormous challenge: When the electrons are at a close range -- as they normally are in an atomic orbit -- forces other than the magnetic one prevail. On the other hand, if the electrons are pulled apart, the magnetic force becomes dominant, but so weak in absolute terms that it's easily drowned out by ambient magnetic noise emanating from power lines, lab equipment and the earth's magnetic field. The scientists overcame the problem by borrowing a trick from quantum computing that protects quantum information from outside interference. This technique binds two electrons together so that their spins point in opposite directions. Thus, like the bouncing tennis ball attached to the measuring device, the combination of equal but opposite spins makes the electron pair impervious to magnetic noise. The Weizmann scientists built an electric trap in which two electrons are bound to two strontium ions that are cooled close to absolute zero and separated by 2 micrometers (millionths of a meter). At this distance, which is astronomic by the standards of the quantum world, the magnetic interaction is very weak. But because the electron pairs were not affected by external magnetic noise, the interactions between them could be measured with great precision. The measurement lasted for 15 seconds -- tens of thousands of times longer than the milliseconds during which scientists have until now been able to preserve quantum data. 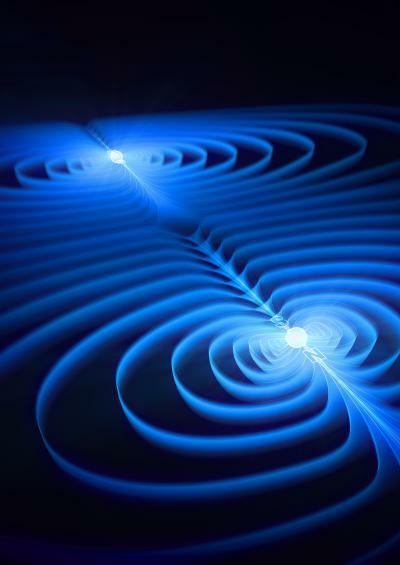 The measurements showed that the electrons interacted magnetically just as two large magnets do: Their north poles repelled one another, rotating on their axes until their unlike poles drew near. This is in line with the predictions of the Standard Model, the currently accepted theory of matter. Also as predicted, the magnetic interaction weakened as a function of the distance between them to the power of three. In addition to revealing a fundamental principle of particle physics, the measurement approach may prove useful in such areas as the development of atomic clocks or the study of quantum systems in a noisy environment.